A 47 acre site at Lymington has been turned into a wildlife haven thanks to local businessman and resident Leon Crouch, his neighbour Amanda Otway and the New Forest Land Advice Service (LAS). Mr Crouch and Ms Otway, who recently bought the land, are working closely with the LAS to ensure the land’s future as a ‘Site of Importance for Nature Conservation’. It is now bustling with insects and wildflowers in the summer and will continue to support migrating birds over the winter. Before: Left to right - Pete Durnell, Hampshire County Council's Countryside Service Sites Manager for the Lymington-Keyhaven Nature Reserve, Leon Crouch landowner and Julie Stubbs, New Forest Land Advice Service Manager looking at plans for the land in March 2011. After: Left to right - Julie Stubbs, New Forest Land Advice Service Manager, Leon Crouch landowner and Mark Larter, from the Land Advice Service in the same field six months later. The LAS provides free, independent advice and support to landowners, farmers, commoners, equine owners, graziers and community groups across the New Forest National Park, the Avon Valley and surrounding area. It is funded by the New Forest National Park Authority, Hampshire and Isle of Wight Wildlife Trust, Natural England and the Verderers. Julie Stubbs, the New Forest Land Advice Service Manager, said: ‘When Leon approached us for advice about managing the land we knew it would be a great project to get involved in and could really make a difference. ‘This area now has a real wealth of habitats. We have worked closely with Leon who has been keen to help enhance an area close to the coast and the Lymington-Keyhaven Nature Reserve. 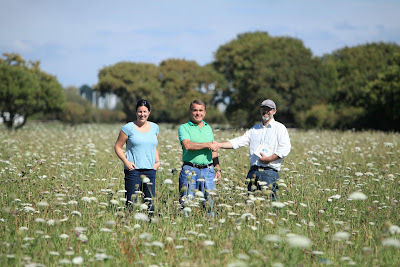 ‘We developed a special seed mix to create wild flower meadows to help regenerate the land with species such as knapweed, wild carrot, oxeye daisy and field scabious. We have also restored the hedgerows through coppicing and replanting. Hampshire County Council's Countryside Service Sites Manager for the Lymington-Keyhaven Nature Reserve, Pete Durnell said: ‘This area of land is protected by a national designation and is home to a large and important population of Brent Geese over the winter months. Landowner Leon Crouch said: ‘I have received a great amount of support and advice from the Land Advice Service and Hampshire County Council. ‘It is good to know that these free services are out there. When I purchased this land it was in very bad condition and needed a lot of work. With the Land Advice Service’s help I have been able to achieve a lot in a short space of time. I have had direct access to experts who have been able to guide me through the whole process. Peter Niccolls said: ‘It’s great that Leon is supporting me to continue the tradition of commoning. Having this land to use for grazing will make such a difference.